How to set up a portfolio manager? 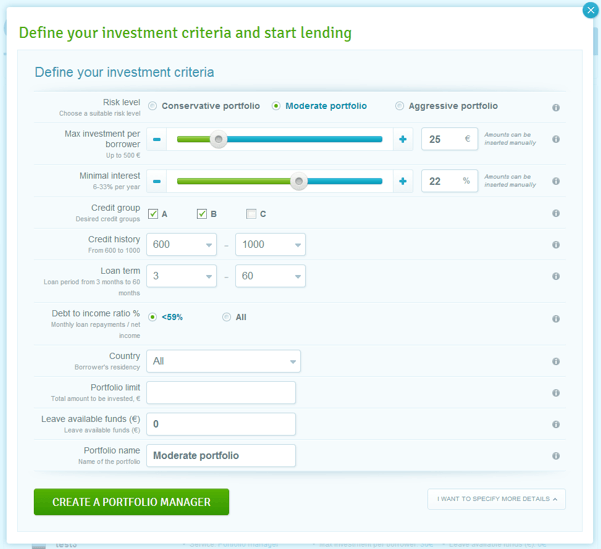 If you are new to Bondora, it may be unclear how to set up your first portfolio manager. Should there be more than one portfolio manager? What criteria should you select? What does “portfolio limit” mean? Today we will explain what to look for when setting up your portfolio manager and start your automated investments. We also suggest that you review the “maximum investment per borrower” criteria, as this option allows you to limit the amount, which your portfolio will be investing per single borrower and, in essence, will determine your diversification and risk level. A popular hypothesis suggests, that the optimal risk level in peer-lending starts between 200-400 loans. This means that if you have invested into 200-400 loans, you are likely to earn returns similar to the entire Bondora portfolio. With this information at hands, you can decide how much you want to diversify, how large your portfolio should be and how much you want to invest into a single borrower. For example, if you decide to invest 20,000 € over a year, you can calculate that with 50 € per borrower you reach 400 loan diversification, while with 100 € you get 200. This option determines the minimal interest rate, with which you are willing to invest. Portfolio manager will attempt to invest into every matching loan with your set minimal (or higher) interest rate. This option, however, has become insignificant for all the loans, except A1000, after the switch to fixed loan pricing, where the interest rate depends on the credit history and credit group. Credit group shows the amount of discretionary income, available to a borrower, where A stands for more income and C for less. Due to our own (additional) restrictions, this usually also means that borrowers from the groups B and C can borrow less, compared to the group A, and with a higher interest rate. Historically, B and C group borrowers have amounted to about 10% of the entire loan portfolio. This field enables you to invest into borrowers with different credit history. The highest score (1000) means that the borrower had no recorded payment problems. The lowest score (600) means that the borrower had some payment problems and that it was resolved less than 6 months ago. Lower credit history score means higher interest rate for a borrower. For an investor, however, this may be an additional investment opportunity with better returns and diversification. This filter allows you to select preferred loan terms, which you can target for your investment. We would, however, bring to your attention that the majority of loan applications are longer-term and only a small proportion of borrowers ask for one-year (or less) loans. If you want to invest a fraction of your portfolio for a limited period of time, you can set up a limit on the loan term filter (for example, 3 years), so that the majority of your portfolio matures by the desired date. b) invest into all DTI levels. So far we have seen a handful of loan applications where the DTI has been above 59%. This means that selecting “all” in the DTI filter can increase your portfolio’s reach. If you prefer, you can create an individual portfolio manager for each country. By default all countries are selected. Portfolio limit allows you to put a cap to the amount of investments you want to make. 1000 € into C600-1000 loans, then you can set up 3 portfolio managers with the aforementioned criteria and your desired portfolio limits. This option gives you the choice to activate certain portfolio managers only when your account has available funds above a certain level. You can use this filter to favor certain investment profiles or ensure there is a certain amount of funds always available on your account (for example, for manual investing or making purchases on the secondary market). Use this option to customize your portfolio name. We recommend you to use a unique name for each portfolio, as you will then be able to filter your investments based on the name and compare your investment tactics or different investment periods. Currently, this is the full list of criteria you can select for your portfolio managers. We are working to enable portfolio managers to also automatically invest into Bondora+ loans in the nearest future, as this marketplace is becoming more and more popular.